Greece is a mountainous country made up of Central Greece, the Peloponnesian peninsula and hundreds of islands. From about 750 BC the Greeks began to colonise other territories and eventually had a presence as far north as modern-day Russia; Sicily and Southern Italy to the west; Asia Minor in the east and Egypt in the south. Republican Rome conquered Greece in the 2nd century BC and continued expanding its territories until, as an empire, it stretched from Hadrian’s Wall in England south to North Africa; and eastwards to the Middle East and modern-day Syria. This Empire covered about five million square kilometres, encompassed forty different modern countries and contained between a sixth and a quarter of the world’s population. 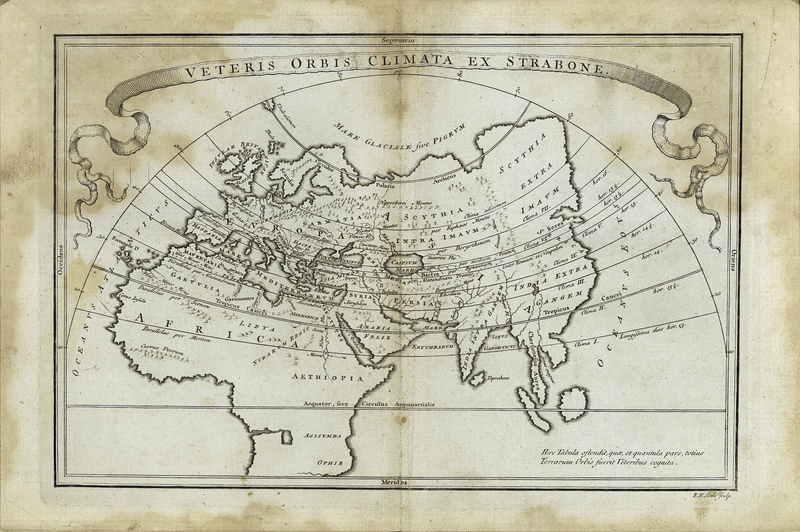 This map, engraved from Cellarius (1638-1707), shows the ancient world according to Strabo (63 BC-24 AD), a Greek geographer. Richard William Seale, “Geographia Antiqua: Being a Complete Set of Maps&hellip;of Gentlemen who make the Antient Writers their Delight or Study,” ourheritage.ac.nz | OUR Heritage, accessed April 26, 2019, http://ourheritage.ac.nz/items/show/7860.